A Biogas Generator is made up of 2 main components; the biogas engine or power plant and the generator that is coupled with the engine. Unlike standard generators running from Petrol, Diesel or LPG/Natural Gas, a biogas generator needs to be able to handle a range of different gas qualities. The biogas production process isn't able to create a consistent quality of gas. The Inoplex biogas generator can handle lower quality biogas than most of our competitors. Looking for a Biogas Generator? 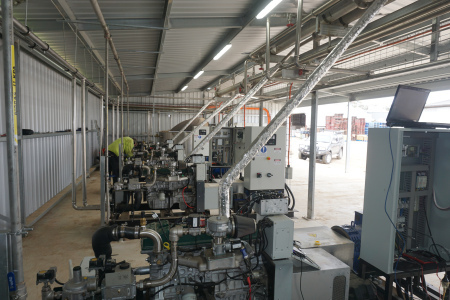 Inoplex are Australian biogas engine manufacturers, creating market-leading biogas generators that run when our competitors' won't. Biogas production is not a completely controlled process like petrol refining etc and therefore results in variable biogas quality. In unfavourable conditions, the biogas quality can be that low that a normal biogas generator can't operate or if it did, would cause potential maintenance issues from running rough. It also means that that biogas engine will run at variable speed, so the generator needs to be decoupled to handle this. The components that make up biogas are extremely corrosive. In fact, one of the main components is Hydrogen Sulphide (H2S). For this reason, biogas generators need to include some form of H2S Scrubber to remove as much as it can. However, this still means that a biogas engine needs to handle this corrosive nature and maintenance can be an issue. How do Inoplex Biogas Generators handle this? Unlike most other biogas engine manufacturers, we believe the biogas engine should be a low cost consumable. No matter how good the quality of the biogas engine is, it still needs to handle the corrosiveness of biogas as well as the ability to run at low biogas levels. If you've spent a lot of your budget on a high end biogas engine, you'll be extremely reluctant to run it when the biogas levels are low and the engine will run rough. With our low cost biogas engine, you can afford to run it rough at low biogas levels knowing that if it finally gives up you can easily afford to replace it. Over the life of the project, your overall return on investment will be higher thanks to increased electricity generation from longer running times. Not to mention, lower maintenance costs. We believe in spending your budget where the real benefits are, a high quality inverter generator with power electronics. By combining our biogas engine with an inverter generator with power electronics, we can generate clean power at any engine speed. So even if your biogas engine is only just running, you will still be generating clean power. Find out more about the Inoplex Cogen Generator.